Where Is the Dollar's Value Headed Next? The value of the U.S. dollar is measured in three ways: exchange rates, Treasury notes, and foreign exchange reserves. The most common method is through exchange rates. You should be familiar with all three in order to understand where the dollar is headed next. The dollar exchange rate compares its value to the currencies of other countries. It allows you to determine how much of a particular currency you can exchange for a dollar. The most popular exchange rate measurement is the U.S. Dollar Index. These rates change every day because currencies are traded on the foreign exchange market. A currency's forex value depends on many factors. These include central bank interest rates, the country's debt levels, and the strength of its economy. When they are strong, so is the value of the currency. The Federal Reserve has many monetary tools that can influence the strength of the dollar. These tools are how the government can regulate exchange rates, albeit indirectly. Most countries allow forex trading to determine the value of their currencies. They have a flexible exchange rate. The U.S. dollar rate shows the value of the dollar in comparison to the rupee, yen, Canadian dollar, and the pound. 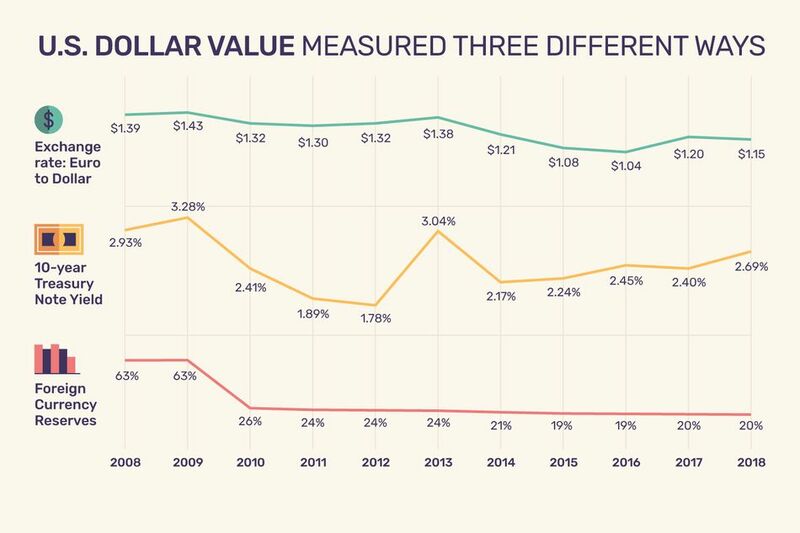 Below, you can track the dollar's value as measured by the euro since 2002. This chronology explains why the dollar's value changed. 2002-2007: The dollar fell by 40% as the U.S. debt grew by 60%. In 2002, a euro was worth $0.87 versus $1.44 in December 2007. 2008: The dollar strengthened by 22% as businesses hoarded dollars during the global financial crisis. By the year’s end, the euro was worth $1.39. 2009: The dollar fell by 20% thanks to debt fears. By December, the euro was worth $1.43. 2010: The Greek debt crisis strengthened the dollar. By the year’s end, the euro was only worth $1.32. 2011: The dollar's value against the euro fell by 10%. It later regained ground. As of December 30, 2011, the euro was worth $1.30. 2012: By the end of 2012, the euro was worth $1.32 as the dollar had weakened. 2013: The dollar lost value against the euro, as it appeared at first that the European Union was, at last, solving the eurozone crisis. By December, it was worth $1.38. 2014: The euro to dollar exchange rate fell to $1.21 thanks to investors fleeing the euro. 2015: The euro to dollar exchange rate fell to a low of $1.05 in March, before rising to $1.13 in May. It fell to $1.05 after the Paris attacks in November, before ending the year at $1.08. 2016: The euro rose to $1.13 on February 11 as the Dow fell into a stock market correction. It fell further to $1.11 on June 25. This happened the day after the United Kingdom voted to leave the European Union. Traders thought uncertainty surrounding the vote would weaken the European economy. Later on, the markets calmed down after realizing that Brexit would take years. It allowed the euro to rise to $1.13 in August. Not long after, the euro fell to its 2016 low of $1.04 on December 20, 2016. 2017: By May, the euro had risen to $1.09. Investors left the dollar for the euro due to allegations of connections between President Trump's administration and Russia. By the end of the year, the euro had risen to $1.20. 2018: The euro continued its ascent. On February 15, it was $1.25. In April, the euro began weakening after President Trump initiated a trade war. The euro fell to $1.16 on June 28, a few days after the Federal Reserve raised the fed funds rate to 2%. A higher interest rate strengthens a currency because investors receive more return on their holdings. But the by end of the year, the euro was $1.15. The dollar's value is in sync with the demand for Treasury notes. The U.S. Department of the Treasury sells notes for a fixed interest rate and face value. Investors bid at a Treasury auction for more or less than the face value and can resell them on a secondary market. High demand means investors pay more than face value and accept a lower yield. Low demand means investors pay less than face value and receive a higher yield. A high yield means low dollar demand until the yield goes high enough to trigger renewed dollar demand. Before April 2008, the yield on the benchmark 10-year Treasury note stayed in a range of 3.91% to 4.23%. That indicated stable dollar demand as a world currency. 2008: The 10-year Treasury note yield dropped from 3.57% to 2.93% between April 2008 and March 2009 as the dollar rose. Remember, a falling yield means a rising demand for Treasurys and dollars. 2009: The dollar fell as the yield rose from 2.15% to 3.28%. 2010: From January 1 to October 10, the dollar strengthened, as the yield fell from 3.85% to 2.41%. It then weakened due to inflation fears from the Fed's quantitative easing 2 strategy. 2011: The dollar weakened in early spring but rebounded by the end of the year. The 10-year Treasury note yield was 3.36% in January. It rose to 3.75% in February then plummeted to 1.89% by December 30. 2012: The dollar strengthened significantly, as the yield fell in June to 1.443%. It was a 200-year low. The dollar weakened toward the end of the year, as the yield rose to 1.78%. 2013: The dollar weakened slightly, as the yield on the 10-year Treasury rose from 1.86% in January to 3.04% by December 31. 2014: The dollar strengthened through the year, as the yield on 10-year Treasury fell from 3% in January to 2.17% by year-end. 2015: The dollar strengthened in January, as the 10-year Treasury yield fell from 2.12% in January to 1.68% in February. The dollar weakened as the yield rose to 2.28% in May. It ended the year at 2.24%. 2016: The dollar strengthened as the yield fell to 1.37% on July 8, 2016. The dollar weakened as the yield rose to 2.45% at year-end. 2017: The dollar weakened as the yield hit a peak of 2.62% on March 13. The dollar grew stronger as the yield fell to 2.05% on September 7. The yield rose to 2.49 on December 20, ending the year at 2.40. 2018: The dollar continued weakening. By February 15, the yield on the 10-year note was 2.9%. Investors were worried about the return of inflation. The yield remained in this range, rising to 3.09% on May 16 then falling to 2.69% by December. The dollar is held by foreign governments in their currency reserves. They wind up stockpiling dollars as they export more than they import. They receive dollars in payment. Many of these countries find that it's in their best interest to hold on to dollars because it keeps their currency values lower. Some of the largest holders of U.S. dollars are Japan and China. As the dollar declines, the value of their reserves also decreases. As a result, they are less willing to hold dollars in reserve. They diversify into other currencies, such as the euro, yen, or even the Chinese yuan. This reduces the demand for the dollar. It puts further downward pressure on its value. As of the fourth quarter of 2018, foreign governments held $6.6 trillion in U.S. dollar reserves. That's 62% of the total allocated reserves of $10.7 trillion. It's down from a height of 66% held in 2015. It's even less than the 63% held in 2008. At the same time, the percentage of euros held in reserves was 21% in 2018. That's less than the 27% held in 2008. The International Monetary Fund reports this quarterly in its COFER Table. When the dollar strengthens, it makes American-made goods more expensive and less competitive compared to foreign-produced goods. This reduces U.S. exports and slows economic growth. It also leads to lower oil prices, as oil is transacted in dollars. Whenever the dollar strengthens, oil-producing countries can relax the price of oil because the profit margins in their local currency aren't affected. For example, the dollar is worth 3.75 Saudi riyals. Let's say a barrel of oil is worth $100, which makes it worth 375 Saudi riyals. If the dollar strengthens by 20% against the euro, the value of the riyal, which is fixed to the dollar, has also risen by 20% against the euro. To purchase French pastries, the Saudis can now pay less than they did before the dollar became stronger. That's why the Saudis didn't need to limit supply as oil prices fell to $30 a barrel in 2015. The value of money affects you daily by how much commodities you can purchase with your funds at a given time. When prices for food or gas rise, your money’s value shrinks because a given amount can now buy less than what it used to. The dollar's value can also be compared to what could have been bought in the United States in the past. Today's dollar value is much less than that of the past because of inflation. The growing U.S. debt weighs on the back of the minds of foreign investors. In the long-term, they may continue to, little by little, move out of dollar-denominated investments. It will happen at a slow pace so that they don't diminish the value of their existing holdings. The best protection for an individual investor is a well-diversified portfolio that includes foreign mutual funds. From 2002 to 2011, the dollar declined. This was true with all three measures. One, investors were concerned about the growth of the U.S. debt. Foreign holders of this debt are always uneasy that the Federal Reserve would allow the dollar's value to decline so that U.S. debt repayments would be worth less in their own currency. The Fed's quantitative easing program monetized the debt, thereby allowing an artificial strengthening of the dollar. This was done to keep interest rates low. Once the program ended, investors grew concerned that the dollar could weaken. Two, the debt put pressure on the president and Congress to either raise taxes or slow down spending. This concern led to sequestration. It restricted spending and dampened economic growth. Investors were sent to chase higher returns in other countries. Three, foreign investors prefer to diversify their portfolios with non-dollar denominated assets. Investors worried about the Greek debt crisis. It weakened demand for the euro, the world's second choice for a global currency. The European Union struggled to boost economic growth through quantitative easing. In 2015, economic reform slowed China's growth. It pushed investors back into the U.S. dollar. The dollar is a haven during any global crisis. Investors bought U.S. Treasurys to avoid risk as the world recovered unevenly from the 2008 financial crisis and recession. Despite reforms, both China and Japan continued to purchase dollars to control the value of their currencies. It helped them boost exports by making them cheaper. The Federal Reserve signaled that it would raise the fed funds rate. It did so in 2015. Forex traders took advantage of the higher rates as Europe's interest rates declined. Since 2016, the dollar has weakened again. Although the U.S. economy remains strong, investors are concerned about the impact of the Trump administration's trade war. At the same time, investors are relieved about the EU's escape from the eurozone debt crisis.